Agencies are on the ground supporting the Government-led response and targeting 191,000 of the most vulnerable, with shelter, food, clean water and other life-saving assistance. Immediately after the earthquake and tsunami, local responders on the ground began efforts to rescue people trapped in the rubble of collapsed buildings and provide urgent assistance to survivors. Although physical access remains a challenge, progress is being made in reaching affected areas, according to the UN Office for the Coordination of Humanitarian Affairs (OCHA) and “the humanitarian response is being scaled up” by UN agencies, international and national non-governmental organisations (NGOs), and the Indonesian Red Cross, in line with the Indonesian Government’s priorities. 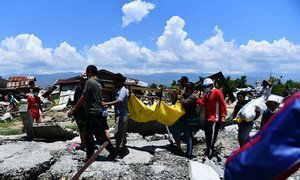 More than 67,000 houses have been severely damaged or destroyed by the earthquake, tsunami and resulting landslides of liquified earth, leaving some 330,000 people without adequate shelter. Around 62,400 people have been displaced by the disaster and are staying in temporary sites with limited access to life-saving services. According to the national agency for disaster management (BNPB), more than 2,700 schools have been damaged, as well as 20 heath facilities and water supply systems. To respond to the most pressing needs, the International Organization for Migration is providing 28,000 gallons of bottled water and 1,700 emergency shelters. The World Food Programme’s logisticians have set up temporary storage structures to enable effective management and dispatching of aid items. 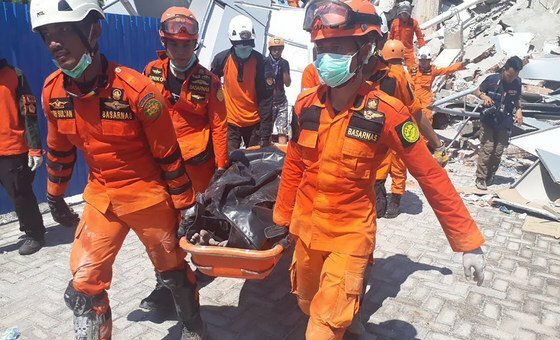 A team from the Indonesian National Search and Rescue Agency recovers a body from the wreckage of a building destroyed in an earthquake which struck Sulawesi in September 2018. Credit: BNPB. As children and women are particularly vulnerable in post-disaster contexts, protection services have been put in place, including child reunification efforts led by the UN Children’s Fund UNICEF, to assist the many separated children, and medical tents set up by the UN Population Fund (UNFPA) to provide reproductive care. Hygiene and maternity kits have been distributed and a team of midwives has been deployed. Shortly after the disaster, the OCHA-managed Central Emergency Response Fund allocated US$15 million to support humanitarian activities on the ground, in particular those laid out in the response plan, prepared by the UN in collaboration with the Government. The plan calls for $50.5 million to reach 191,000 of the worst-affected women, children and men.